T’is the season! Maybe. Is there even a season for mead? It feels like that season should be right because this is when I felt like making another batch of mead. I really enjoyed making growler sized batches in the past. It’s less of a committment and lets you save money and ingredients while experimenting. Or split up a larg batch by fermenting in many indivdual fermenters and adding different ingredients. Whatever you want! Mead is really versatile, and I have never made a bad batch except-but-not-really my first, which was a duo-project: a juniper mead that I thought was brilliant but apparently to some it tasted like olive oil. I don’t get it either. Yarrow is a great ingredient for mead, as fellow BFB-er Jesse Black has demonstrated in a previous post describing his own yarrow mead recipe. It’s bitterness and astringency neutralize sweetness and the floral, terpentine and cedar or sage-like aromatics add wonderful personality and flavour. Yarrow is also powerfully medicinal; disinfecting, reducing swelling, irritation, inflammation or pain and detoxifying the blood and urinary system. Calendula petals were added to impart a strong golden or orange color to the finished mead, as well as slightly thicken and add silkiness to the texture. Bring 1 litre or so of water a boil. Once boiling steadily, gradually add honey and continue to stir until dissolved. Add half the yarrow leaves (approximately 0.2 ounces) and stir until throughly moist. Cover only slightly and allow to simmer for 20 minutes. Pour calendula pedals and the remaining yarrow into growler or other suitable fermentation vessel. Pour hot honey wort into growler, while straining out the boiled yarrow. 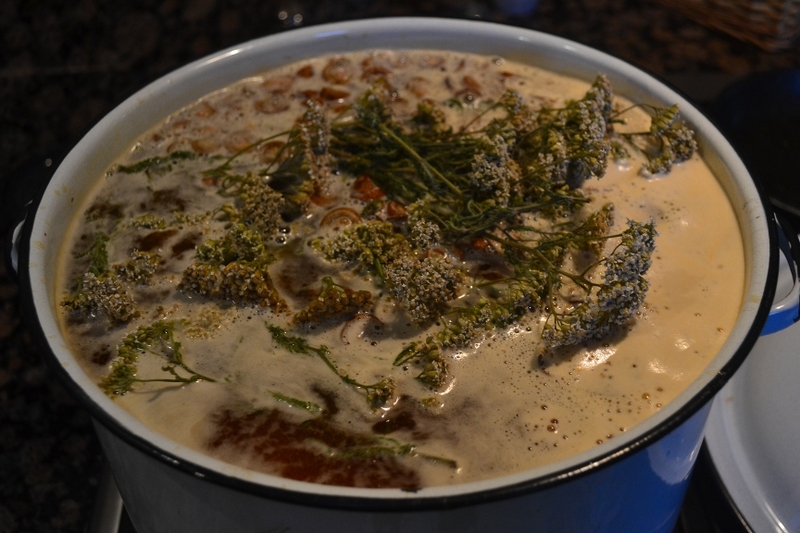 Wait 5-10 minutes to allow the fresh yarrow and calendula petals to steep in the hot mead before topping up with another 1 litre of cold or room temperature water. Place cap or lid on growler/fermenter until room temperature; approximately 3-4 hours. Once cool enough or only slightly warm to the touch, remove cap/lid and add yeast nutrient and champagne yeast. Give one last stir and plug in the air lock: only straining out the herbs when it is time for bottling. Anyone who has tried the seeds of parsley or celery already has a general idea as to the flavour profile of carrot seeds. These plants (as well as dill, fennel, cumin, lovage and parsnip among many others) are all members of the Apiaceae, a botanical family. Although unique, all of these plant seeds have a recognizeable pungent, aromatic and almost ‘pine-y’ aspect to their aroma and flavour. 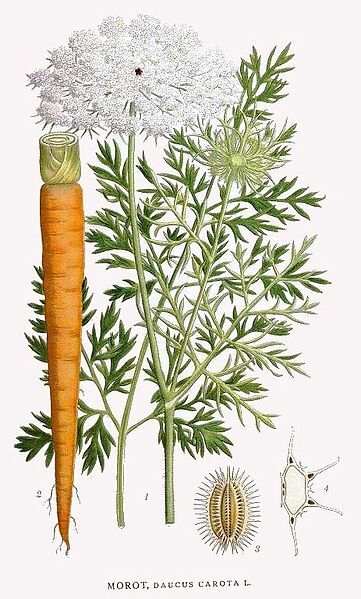 This characteristic set of attributes was certainly not overlooked centuries ago when the seeds of wild or cultivated carrots (the plant Daucus carota) were used as a complimentary ingredient or substitute for hops in beer. I have paired wild harvested carrot seeds with 2 different hop varieties into what I hope will turn out to be a very beautiful combination of earthy aromatics and complex bitterness. Please refer to my older posts for more of a step-by-step guide to brewing beer. I feel like at this point I am just repeating myself over and over, especially for those of you that are reading this blog every once and a while and probably getting tired of it. For my next batch of beer (still in the works), I think I am going to try putting the wort through a secondary fermentation. This is basically just draining the beer, after it has fermented and gone dormant once, into a new sterilized fermenter and letting it undergo another partial fermentation. By doing this you can be sure that the final product has had the majority of the available sugars converted into alcohol. Because the secondary fermentation works with relatively little sugar available in the wort, the vast majority of which was eaten up during the primary, this next fermentation is slower and more complete, digesting some of the more complex sugars. This isn’t going to make anyone happy. It certainly didn’t improve the quality of my day. About 2 days into fermentation, the 6 gallon capacity glass carboy that Charlie was humming away inside exploded, sending frothy herbal goodness sloshing all over fellow BFB-er Robert Nagy’s basement bathroom. It was a pretty big bummer. I think that this new addition of the Creep was too good to be true: and the pure awesomeness that it held within it’s beer-y depths was too much for physics to handle. Next time, only 4 gallon batches in the 6 gallon carboy. Either that, or use a bucket which was a bit more give. According to other BFB-er Chris Veska, the airlock may have prevented enough CO2 from escaping, a detail which could have saved this brew from it’s premature end. Even putting tin foil over the opening of the carboy, once the fermentation is in full swing, is enough to protect the wort inside from any ‘badies’ that might try to get it. Makes sense, seeing as a beer in full fermentation is pretty aggressive. Oh well, live and learn. This also means that Creep ’14 is going to have to be even more serious than ’13 or ’12. Jordhumle is an old-time Scandinavian name for yarrow (Achillea millefolium) meaning earth hops. This is a play on the plant’s historical use as a bittering and preservative agent in ales commonly used in communities until the 18th century, when bitter resin in the unripe female flowers of hops (Humuls lupulus) became the preferred ingredient of choice. It’s also a term, among many that are no longer in common use, that can describe any herbs that were used as a substitute for hops up until the point that hops was legislated in as the only legal herbal preservative in beer. Anyhow, I found this old nickname extremely appropriate to describe my newest gruit style ale, which features the bitter, resinous scented flowering tops of yarrow and the deep, woodsy aromatic and bitter-sweet tasting roots of burock (Arctium lappa). 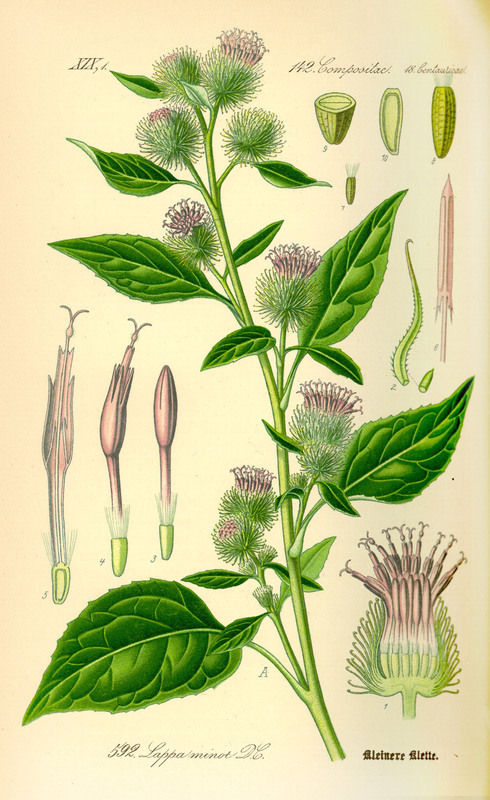 Burdock, the plant that graciously supplies us with burs to get caught in our clothes, bears a 1-3+ foot long taproot which has long been used as an ingredient in strengthening, blood purifying tonic beers taken in the spring to cleanse the body from a monotonous winter diet lacking in fresh fruits and vegetables. The roots, rich in iron, calcium and other minerals, can also be used to improve the function of the liver and revive a sluggish digestive system by stimulating digestion before and after a meal. Yarrow was an even more popular ingredient in centuries old beer recipes, being added for it’s potent anti-inflammatory and anti-bacterial properties. The leaves and flowering tops can be used medicinally to prevent headaches, clear sinus congestion, sooth sore throats, quell aching teeth, relieve thirst, improve digestion, prevent heavy and painful menstruation, fight viral and bacterial infections, stimulate the recovery of injuries, stop heavy bleeding, disinfect wounds and assist with countless other maladies. The inclusion of yarrow in a recipe was also believed to make the resulting beer more intoxicating, much the same as Labrador-tea (Ledum groenlandicum and spp.) which has narcotic-like effects when taken in large enough doses. I have been wanting to use both of these herbs in a recipe for a long time. I am sure that they could both be featured in their own individual recipes to extenuate their own unique personalities, and that is most definitely going to happen at some point. I am hoping that this recipe will create a slightly bitter ale with a deep aroma of damp moss and rotting logs complimented with a balanced resinous, woodsy and floral flavour. 6 ounces fresh or 3 ounces dried burdock root, coarsely sliced. 1. Bring either 1 or 1-5 gallons of water to a boil. Make sure that the pot is only around 50% full in order to accommodate the addition of the next few ingredients. 2. Carefully add the liquid amber barely malt extract to the water. This is going to be an annoying, sticky mess no matter what but be advised to take some precautions. Stir while adding the malt so it doesn’t burn at the bottom of the pan. Try to get as much of it out of the containers as possible. It might even be worth while to remove the pot from the heat until all of the malt is in there and dissolved evenly. 3. 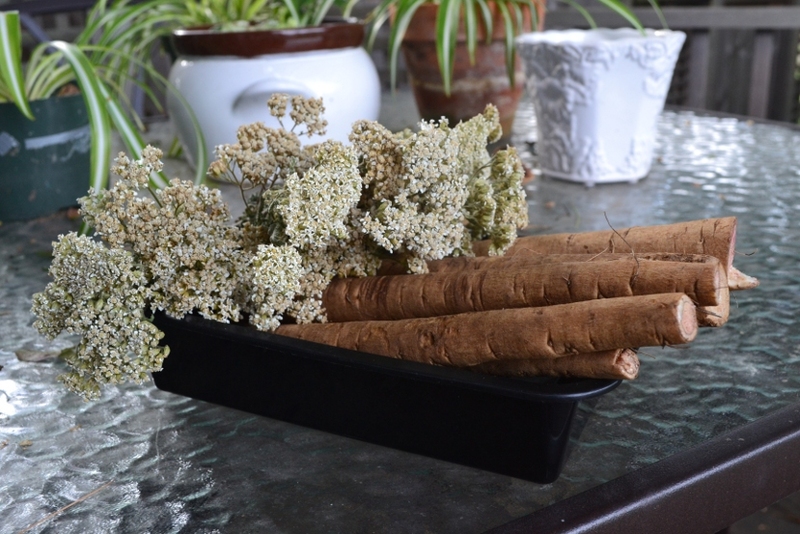 Bring the water back up to a boil and add the sliced burdock root chunks and yarrow flowers. The yarrow can be added whole because it limps up quite a bit. Set timer for 30 minutes. 4. 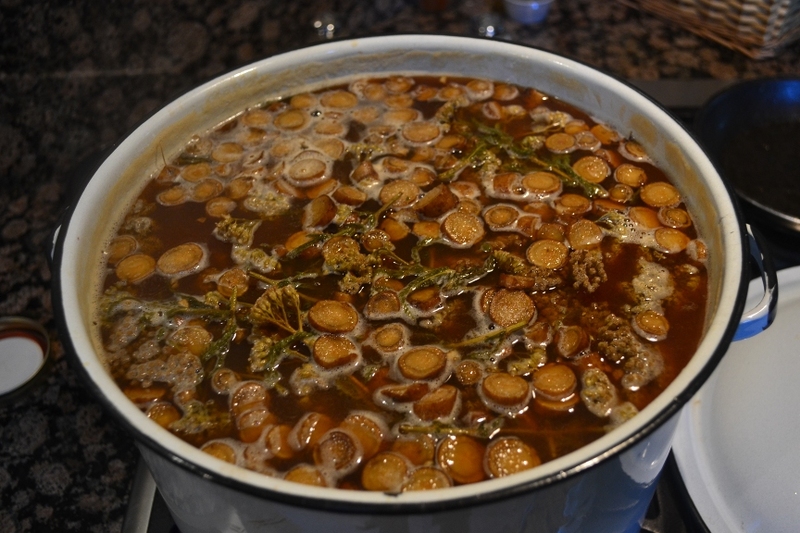 Reduce the heat to a simmer and cook the herbs and the malt for 15 minutes. Stir occasionally, as the herbs like to float. 5. Once 15 minutes has passed, add the Irish moss tablet and the 20 grams of Cascade hops, sprinkling them slowly into the wort. Stir until the Irish tablet completely dissolves, about 2 or 3 minutes. Hops has a tendency to make the brew foam like crazy, so keep stirring and turning down the heat until you have a consistent simmer. If you full on boil it, the wort is going to throw up all over your stove. Whenever you are not stirring, you can have the lid on the pot to retain heat but with a slight crack. Also, don’t leave the room after the hops is in there. Keep an eye on it for the first 5 minutes especially once it goes in. 6. Once 30 minutes has passed, turn off the heat. Remove the now finished wort into a location where it can sit and cool down, with the lid covering it. I stick in a thermometer to monitor the temperature as it cools. You want the wort down to at least 100 °F (optimally 70-75 °F) before you proceed with the next step. If your beer looks like soup, you’re doing it right. 7. Using something like potassium metabisulphite or Diversol, sanitize a carboy or fermenting bucket, funnel, strainer and airlock (make sure that it is fitted to your fermenter). 8. Strain and pour the wort through a funnel into your fermenter. Top up the carboy with water until a total of 4 gallons is reached. I wrote in with a permanent marker the measurements on the outside of my glass carboy, which makes this easy. I suggest you do that too, on whatever you are fermenting in for future reference. 8. Pitch in the 30 grams of de-bittered ale yeast (It is a good idea to let it sit out the night before so it is room temperature when you add it) into your fermenter with a funnel and insert the airlock. Done. Now clean up the huge mess you’ve made and wait 5-7 days until fermentation is complete. Ever since my Licorice Ale was ready about a week ago, I had my eyes set on producing another homebrew. Best not to run out of anything, right? At least that is my train of thought. Like a lot of the other beers that I have made (some of which featuring the mathamatical and logistical skills of Robert Nagy) this one was contemplated for a long while, although the fine tunings of how much/when to add it/how long to have it boiling were finalized on a whim. But that’s fine with me, I have developed a bit of a liking for haphazard beers that come together as they are being made. It’s sort of like with cooking. As long as you know the basics, you can’t really go wrong. This recipe has quite a bit in it. I was originally going to use just Cascade hops and the seeds of the wild carrot plant (Daucus carota) to provide flavour and bittering, but at the last minute decided to include some other herbs/ingredients that I had lying around and probably were not going to use for anything anyways. Batch size: 4 gallons. Ingredients: 4 gallons water, 4.4 pounds (1.5 litres) liquid amber malt extract, 50 grams Cascade hops, 3 ounces dried and crushed wild carrot seed, 1 ounce dried yarrow (Achilles millefolium) flowers, a few sprigs of fresh rosemary, 1 irish moss tablet and ale yeast. The hot wort cooling down outside next to the bbq. Instructions: I brought 1.5 gallons of water to a boil on the stove and then added all of the liquid malt extract, stirring in order to avoid the malt sticking to the bottom of the pot and burning. Right after I added all of the hops, and then started the timer at 20 minutes. After letting the hops/malt to boil for 5 minutes, I added 1 irish moss tablet and then allowed the wort to boil for another 5 minutes. With 10 minutes remaining, I added the yarrow flowers and wild carrot seeds, stirring to dissolve them and to ensure even cooking. After another 5 minutes, I added the sprigs of rosemary and let the wort boil for the last 5 minutes. Then I transfered the wort (with all of the ingredients still in it) outside near the door to cool down. I waited about 5 or 6 hours for the wort to cool to room temperature (18-23 degrees C / 65-75 degrees F) and then strained the wort into a sterilized glass carboy where fermentation will take place. Since I only brought 1.5 gallons to a boil instead of trying to boil all 4 gallons of water at once, which is totally impractical unless you have all the right equipment, I needed to top up this concentrated wort with 2.5 gallons of water to bring it up to a grand total of 4 gallons. Then, in went the yeast and on with the airlock. Process complete. Yeast freshly pitched into the room temperature wort. Progress: In less than 24 hours this beer was feverishly fermenting and has started to taper off now (I made this on Thursday night and now it is Monday afternoon) so I estimate that by the middle of this week it will be done fermenting and ready to be added to bottles to condition and carbonate. Today (Tuesday) the activity has almost completely stopped. Note: home brewing is extra fantastic. Licorice (Glycyrrhiza glabra) is a plant deeply entwined with early European folklore and has enjoyed many centuries of use as a choice medicinal plant. The roots contain an array of chemical compounds which impose a positive influence on the liver as well as strengthen and regulate the digestive, nervous and respiratory systems. The roots are also anti-spasmodic, mildly pain-releaving and have wonderfully soothing and healing capabilities. Most of us know of licorice not as a therapeutic herb, but as the flavouring for those black rubberoid candies. Although it’s true that licorice was used as a sweetener centuries ago in traditional Europe, the flavouring used in those candies is derived from extracts of anise (Pimpinella anisum) or fennel (Foeniculum vulgare), two unrelated plants. Licorice root is palatable and incredibly sweet, much unlike the sour-tanginess of anise or fennel. Licorice root also has a long history of being an ingredient in beer. It was added in generous quantaties to porters and stouts to make them thicker, darker and produce a longer lasting head. Also, The sugars that are contained in licorice cannot be digested by the yeast, and therefore linger in the beer after it has fermented and provide a glamorous and unusual sweetness that is like nothing else. So why not make a beer with licorice, seeing how medicinally valuable it is and how agreeable it seems to be with enhancing some important qualities in beer? Sure. Sound’s good. I made this 3 gallon batch with liquid amber malt extract, hops I collected growing wild along a bike trail just outside the town of Lindsay, and a few chunks of whole licorice root. The only issue I had with producing this one was that it didn’t ferment initially. I must have pitched the yeast into the wort when it was still too warm, thereby killing all my yeast buddies. After adding the yeast a second time I saw successful fermentation starting. Because of that, you can definitely taste the yeast in this beer. But it’s fine. Besides that, I really like everything else about it. The color is amber, as one would expect when using amber malt, and quite cloudy. The texture is smooth, soft and creamy; aroma intensely sweet with some dried apricots but overall uniquely that of licorice root. The flavour is fascinating; faintly malty with a possible overdose of floral, earthy sweetness. Pour this one rather slow, so as to not be overwhelmed with head. At 6.5%, this super-sweet treat is quite a bit to handle. I am definitely going to let a couple of these boys sit for a few years and see what this might turn into.